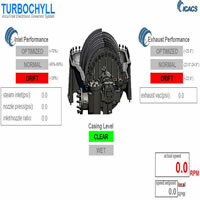 TURBOCHYLL ACCUTRAK Electronic Governor System was introduced to integrate, function and operate the Turbine Governor with contemporary Steam Turbine Chiller performance expectations and strategies. The days of large, complex and often unpredictable hydraulic and mechanical type governor systems are simply not consistent with the demands of today's energy and performance minded operators. 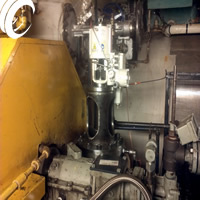 ACCUTRAK replaces this large hydraulic and often obsolete arrangement with an oil-less Smart-Valve that function on highly accurate m/a signals for precision control of the turbines intended speed setpoint. This and special high speed "electro magnetic" balanced collars permit fine control to 0.1 RPM. When coupled up to the TURBOCHYLL ACCUTRAK front end processor, the package is afforded the intelligent logic for complete Local Operator and or Optimized Chiller Control Function. Accurate function to SLOW ROLL, WARM UP, MINIMUM GOVERNOR and MAXIMUM GOVERNOR control are clearly and dynamically displayed in 8" color graphics. The ACCUTRAK EGS Human Machinery Interface "touchscreen" permits operation of the turbine. From a waiting idle state and critical band to full automated operation - ACCUTRAK does it all. No longer will it be required to find large high pressure steam valves necessary to throttle and maintain warm ups and critical band navigation in an unsafe and often cumbersome area. Fit with large Audio and Visual Indicators, turbine pressure, Temperature and level sensors as well as Smart Valve governor actuators, ACCUTRAK will offer features not seen in tradition Steam Turbine Chillers before. Steam turbines used in chilled water refrigeration applications are almost always the single largest energy consumer to the facility owner and or plant manager. These appliances are considered essential to today's global comfort cooling, economic and industrial growth demands. Critical monitoring and care to continually maintain and improve turbine performances has become essential to contemporary energy acceptance desired by plant managers. More specifically are the INLET PRESSURE and EXHAUST (Vacuum) PRESSURE regions of the turbine. Steam inlet pressure and exhaust vacuum of the turbine has a direct correlation to turbine performance. Obtaining and maintaining the turbines "nozzle inlet" at or near design inlet through the use nozzle control will improve turbine performance through reduced steam consumption. 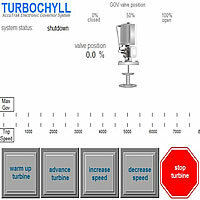 A simple nozzle adjustment for a steam inlet pressure correction by 15psi will reduce the steam consumption in the turbine by about .3% and improves the turbine efficiency by about 0.1 % respectively. Vacuum conditions provide even greater impact to operational available opportunities. Where we find higher exhaust pressure (poor vacuum), so will we experience increased consumption, as well as compromise to overall efficiency. A loss of vacuum or drift by as little as .35"Hg will find the steam consumption to the turbine increased by about 1.0 %. Therefore, a 1200Tr Steam Turbine Driven chiller in a NY commercial building application left operating a season with 22"Hg and 40psi inlet would find a loss in efficiency of over 10% and an impact to cost of over $66,000.00* compared to same chiller with optimized inlet and vacuum. Fortunately, with regard to condensing type turbines found in refrigeration chiller applications, we have these conveniently accessible operating parameters which provide very significant opportunities for energy recovery and optimization. With the selection and installation of critically installed and highly predictable ifm® sensing devices at the turbines inlet and exhaust, the ACCUTRAK continually monitors and responds in an advisory fashion that the turbine is in an optimized state of performance. Conversely, critical points of drift are decidedly required to advise the demand for corrective control when either the inlet or exhaust correlation is not consistent with sustained energy performances. Such information is presented both in the field through audible voice command output and visual indicators and simultaneously uploaded to critical building systems via MODBUS or BACNET protocol. ACCUTRAK remains the only choice for today's performance minded Steam Chiller operators demanding the intelligent control of performance combined with modern energy sustainability.